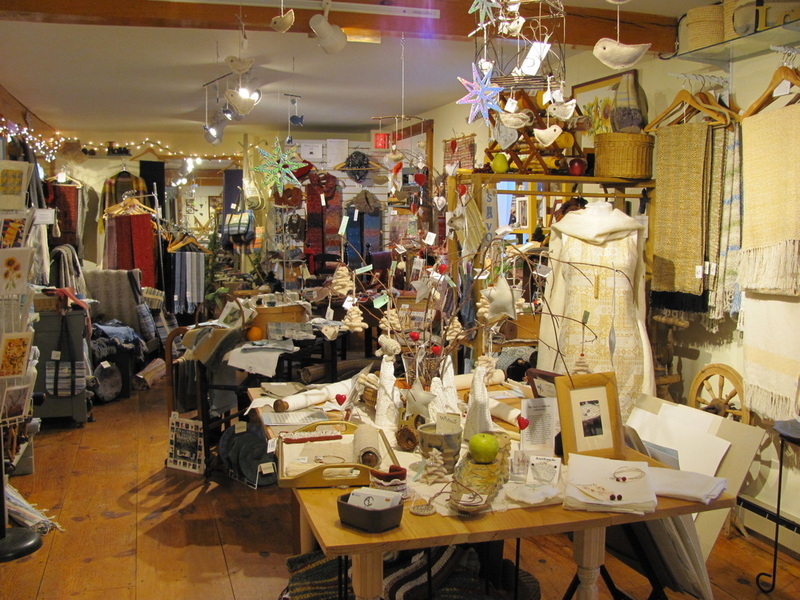 My Studio & Gallery is located in historic Tiverton Four Corners in Tiverton, RI within an hour from Boston, Providence, Newport and Cape Cod. Those familiar with the SouthCoast region of Massachusetts and Rhode Island know of this area for its farms, small villages, coastal waterways, beaches and wineries. From Providence : Take Rt. 195 East to Rt. 24 South. Exit 5 onto Rt. 77 South; 6 miles to Tiverton Four Corners, just through the Lights on the Left. From Boston : Take Rt. 128 to Rt. 24 South Exit 5 onto Rt. 77 South. Then approx. 6 miles to Tiverton Four Corners, just through the Lights on the Left. From Cape Cod : Take Rt. 195 West to Rt. 24 South. Exit 5 onto Rt. 77 South; 6 miles to Tiverton Four Corners, just through the Lights on the Left. In the studio workroom several looms are set for a variety of projects. You can see actual pieces in their various stages and appreciate the processes involved in handweaving. Finished scarves, table linens, blankets, rugs and more are for sale in the gallery. I also use the many looms to teach students of different skill levels, from beginners just starting out to those looking to hone their skills on special projects through guided tutorials. 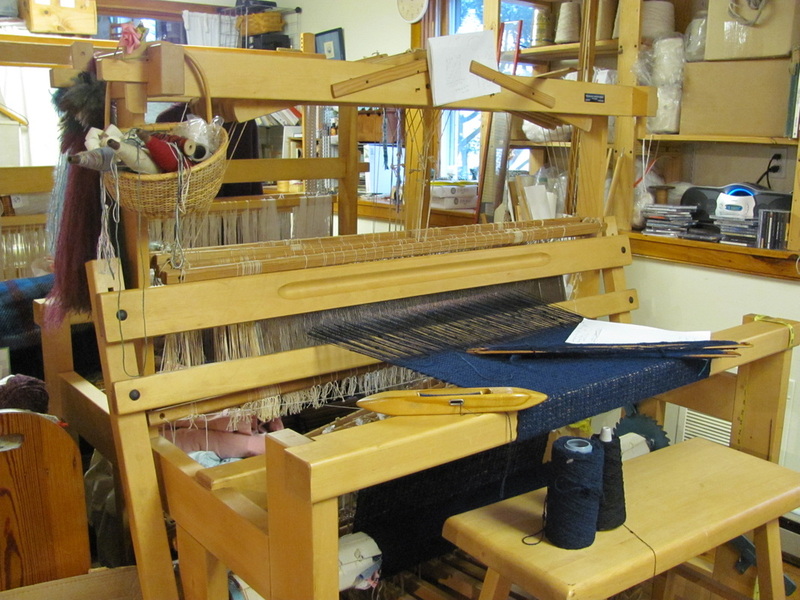 Plan a day to come in and try a loom, or reserve a week to learn the entire process. See Below for samples of upcoming Calendar Events and Classes. Want to get Creative? I know You've been thinking about taking a class for a while! That's why you are here! Call today 401.816.0000 to schedule a 1/2 Day or Full Day weaving class to make something for yourself or to give someone! Expand your skills while having some fun with fiber. Most classes are Saturdays, although they can be scheduled other times, if needed. General class descriptions and schedule below, although subject to change depending on demand. Call 401-816-0000 or email aclhandweaver@gmail for more information. I also make Dollhouse Handwoven Textiles and Miniature Weaving including Placemats, Rugs, Blankets & Table Runners, and Dabble in a few other things... Browse my bits of Fancy and allow your Imagination to grow. Good things come in Small Packages! ...Let your Imagination & Whimsy Wander through the Door. Stroll on over to Middle Street Miniatures, Where We have Handcrafted 1/12 Scale Miniatures for Dollhouse Collectors looking for Unique Style & Design. Furnishings & Decor for Small Homes. Why Choose Artisan Handmade, Handwoven Fabrics? More About Handmade in RI Tax Free Shopping!